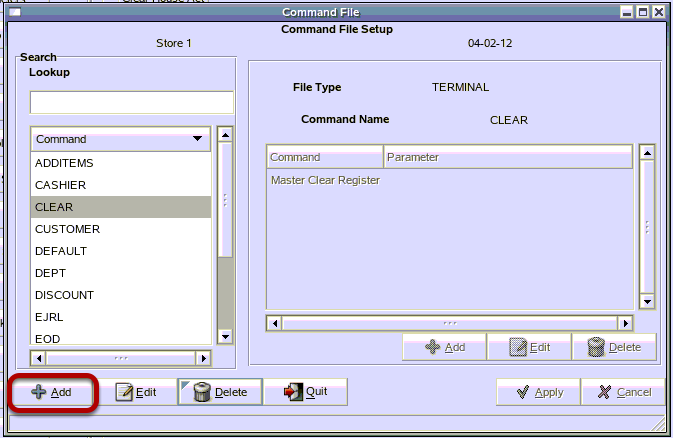 TravStar1 Point Of Sale SystemManager's Work Station Additional SetupHow Do I Setup and Send Commands to the Register? How Do I Setup and Send Commands to the Register? 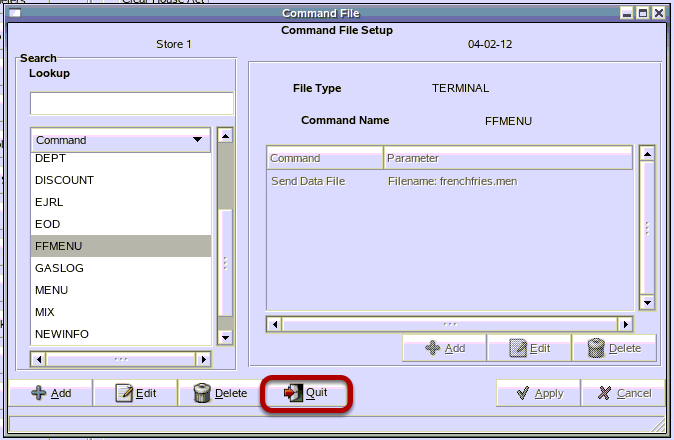 This lesson will teach you to setup a command and executing that command to send files to the register. 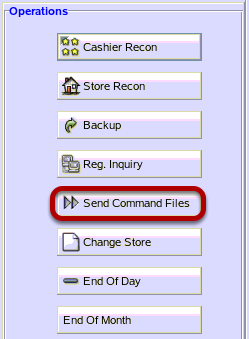 In our system we have several premade commands that cover the majority of the files that you will need to send to the register. But there may be times that you create a unique file that needs to be sent that is not included in our other commands. For this lessons example, we will be creating a command that will send a menu file that we created in the lesson How Do I Setup A Menu File? 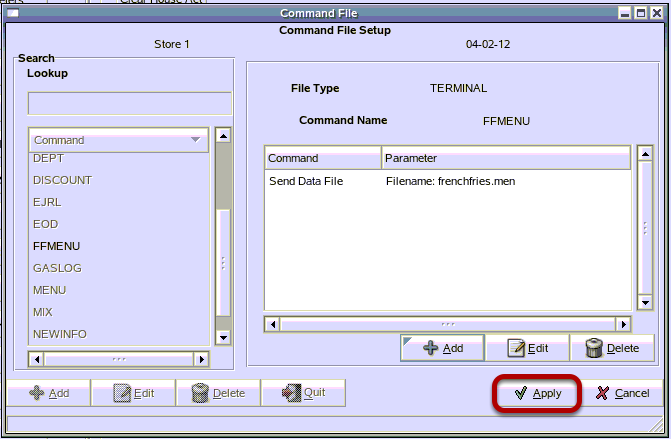 From the setup menu, click on the "Command File Setup" button. 1) Type the name of your Command. 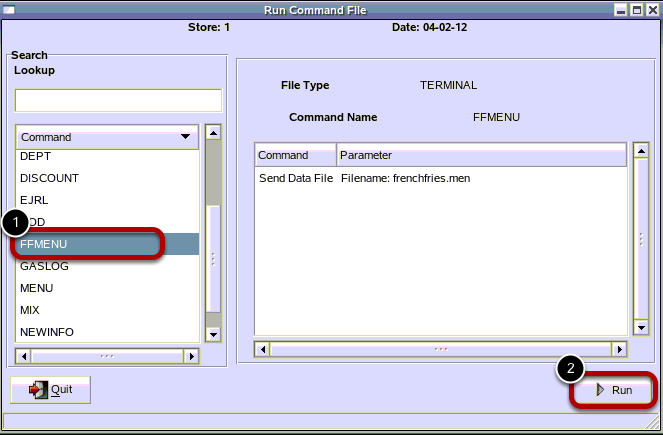 Since in this example we are sending the french fries menu , we have named it FFMENU. You can have up to 8 characters in the File Name. 3) Click on the "OK" button. 2) Click on the "OK" button. 1) Type in the name of the menu file you are sending. Now you are ready to send the file to the register. 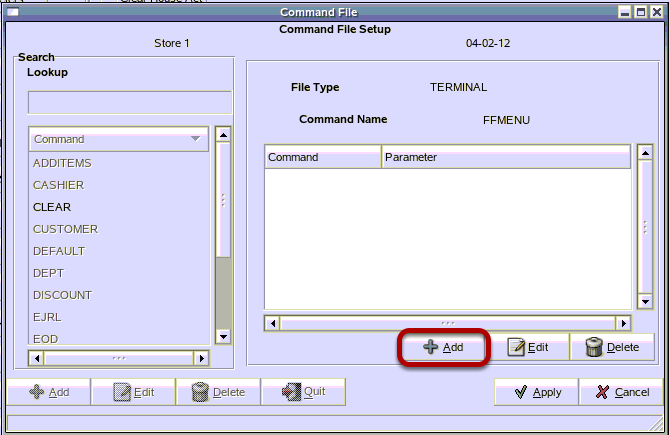 Proceed to the next step for instructions on how to run a command file. 1) Click on the name of the command you wish to send. 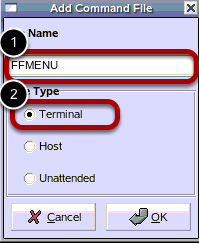 In our example we are sending FFMENU. 2) Click on the "Run" button. 1) Click on the down arrow to select which register you are sending the file to. It is best to send department the file to 1 register at a time and allow it to send completely before sending to another regsiter. 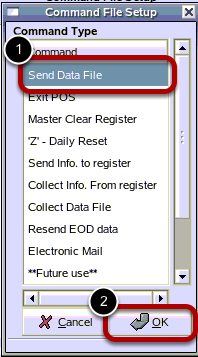 Menu files can be sent to registers without running a Register Z. See What Files Should Be Sent To The Register? for information on which files require a Z to be ran when sent to the register. 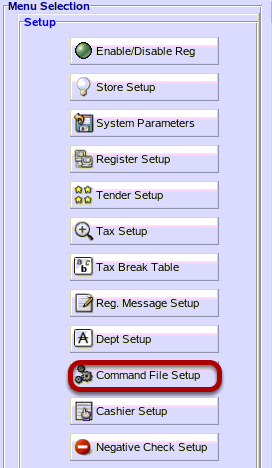 Please contact Fiscal helpdesk for assistance with adding or editing buttons at the register. Prev: How Do I Change the Information on POS Receipts? Next: How Do I Add a Bad Check Customer?